Today is a super fun day over at Altenew! Today is the June Release day! I have 3 projects to share and there are prizes! Scroll down for the giveaway info and for the entire blog hop list. If you are following along, you just got here from May's blog. Isn't she amazing? Altenew's new stamps and dies are just as stunning as they are each month but I am loving the new products I have to share with you today! This first card showcases the new set called Ditsy Print paired with my favorite hello die in the history of ever! :) This set is perfect for the clean and simple stamper. 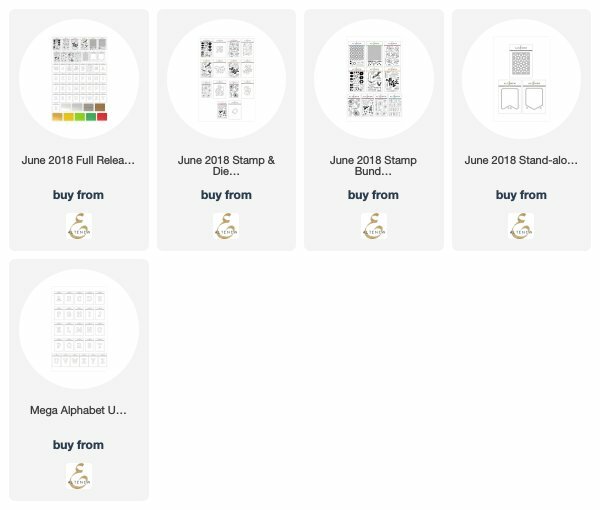 It has beautiful outlined stamps and then the solid centers making it for a quick, beautiful image. To create this card I stamped and heat embossed the floral image from the set all over a piece of vellum. I flipped the vellum over and on the back, I used Copics to quickly color in the flowers and leaves. I added the hello die in white card stock to the front of the vellum panel. On the back, I added adhesive behind the hello die and then added that panel to an aqua card base. I am a HUGE fan of banners. I love having them for special days at the house, for my craft room...really any occasion needs a banner! This month Altenew has some new products that have me geeking out...perfect for making all the banners! I grabbed a rainbow of colored card stock and used the Pocked Banner Die to cut out 8 banners. Next, I took the new background stamp called Pinstripe and put it in my Misti. I was able to quickly stamp all 8 banners with the stripes, all perfectly even, half way covering each piece. Next, I used white card stock and cut out the words Happy Day. I added each letter to the banners with foam tape for some dimension. Using white twine and white mini clothespins to string up the banners, it's now ready to hang! Here is a close up of 2 of the panels....I adore those stripes! This makes for a quick, clean and simple banner. And looks at those little pierced dots around the edge! Love that the Banner dies add such a fun detail. One last, easy peasy project! To create this card I stamped the leaf images from Leaf Canopy in black ink. I added a tiny pink dot of ink throughout the images. I grabbed the new alphabet die called Tall Alpha....LOVE!!... and stamped the sentiment in pink ink. I attached the white card front to a pink card base and left a tiny bit of the pink base showing on the side and top for some more color. I am so glad you stopped in today! I hope you have enjoyed my stop on the hop. Now head on over and Erum and see her amazing creations! Wow! Love all of it! The banner is beautiful and absolutely love the cards! Wonderful projects, but I absolutely love the embossed vellum card! So much fun in this release. WOW! Love all your projects!! Have to say though how soft, delicate, and beautiful your vellum card is..a real stunner! 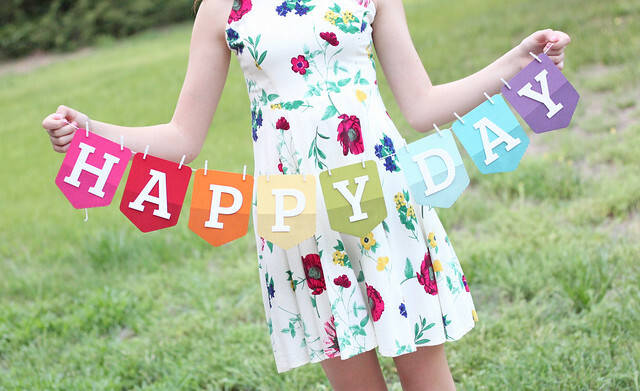 I love that happy day banner! Thank you for beautiful inspiration Laurie! 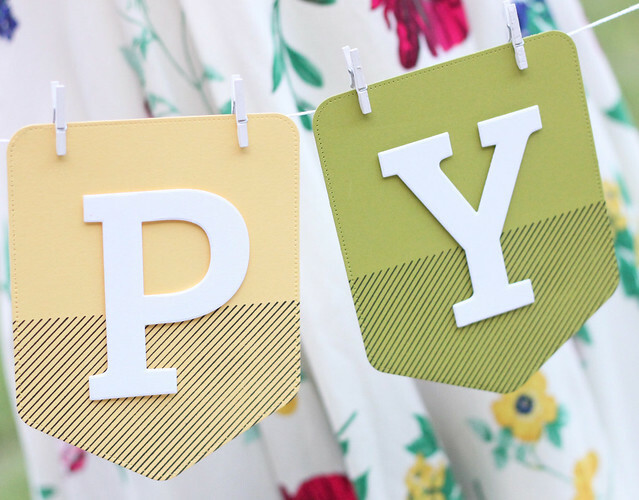 wow, I love the background you created with the Ditsy Print! Laurie, I love the pastel Hello card. So beautiful! Beautiful banner! 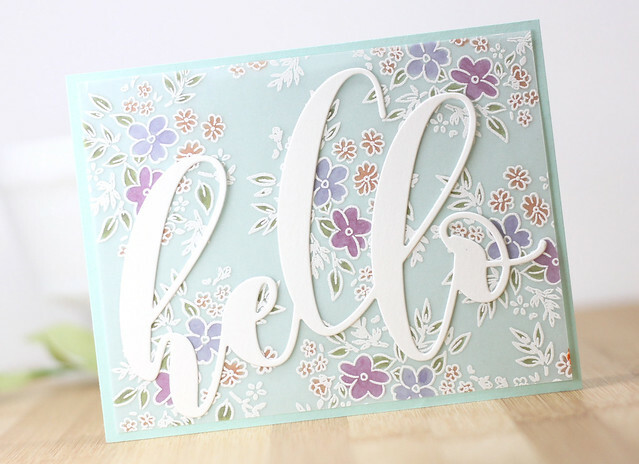 And, the Hello card is so pretty! I thought I might be safe this month with the banner..then I saw this post! Love the daisy print and rainbow banner?? Oh my poor wallet! Gorgeous cards and a awesome banner! My favorite card is the simple black and pink card. It says to much with so little. Love the cards and love the new releases. Great job! Love your cards and banner! Especially the first one, I love using vellum, it gives the card such a pretty soft look! Great cards, the vellum one especially. This card is so cute!! Love the whimsy flowers and the colors too!!! Love how u used it to make the background! Very nice! Thanks for sharing your gifts. Love the way you used the new Ditsy Prints on vellum! Love the Blue background with the flowers. The Black and Pink card is stunning. Such fun creations, love the banner & your coordinating dress! Thanks. 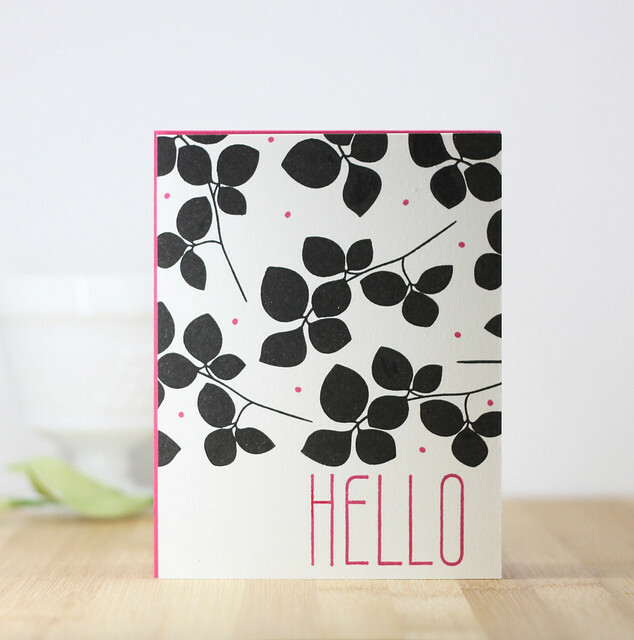 Great projects - love the clean, crisp look of the Leaf Canopy card. The hello card is so delicate. The leaf canopy card with the silhouette effect is striking. That leaf set jumped out at me when I saw all the new release items. Your cards are lovely Laurie, especially the first one, how pretty! Your banner is fantastic too. (My daughter makes banners for every season and occasion and changes them out regularly.) These alphabet dies are perfect for this. ♥ IT! I love the banner! Adorable! I agree with you that the card is totally my favorite EVER! I had not planned on buying that set but will be putting in my next order. Lovely ideas! Love the flowers and what you've done with it. The colors are lovely. Beautiful projects!Thank you for the inspiration! Beautiful projects! Thank you for the inspiration! vellum like that. It looks like designer paper! Perfect. Lovely cards...especially like the Ditsy set you used!!! I love your flower card. The big Hello looks so nice with it. Beautiful projects, Laurie! Both cards are so pretty and I love your banner! I'm so glad you were part of today's hop...you have showcased the new goodies perfectly! Love your two projects especially the sweet card! The large hello is awesome! Your first card is one of the prettiest cards I've ever seen! Your leaf caonpy card is very simple and elegant. Love your rainbow banner too. Love all your projects today! Beautiful coloring on back of vellum for Ditsy floral bouquet and still loving the Mega Hello die. Super fun rainbow banner project and LOVE the touch of pink dots on the leaves card. Lovely cards, and the banner is awesome! 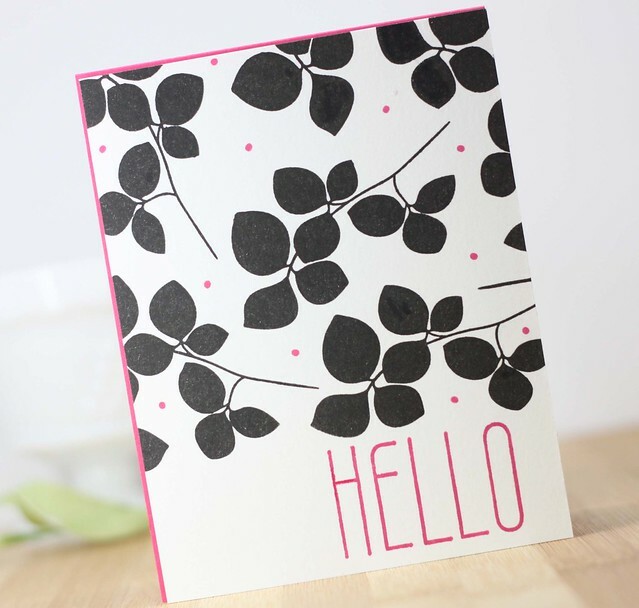 I love how that leaf canopy stamped card is so simple and looks so great! I'm super excited about the banner dies too! I love how you used the pinstripe on them... what a great idea! A great release that would make great cards for a long time! Thanks. These are all so cute. I love the little floral and the giant Hello. I love what you did with the Ditsy Print set. Lovely. Fantastic examples! Love the banner die and the alpha dies! Your cards are stunning. TFS! WOW!! What stunning projects!! Your banner is amazing!! Your Hello card is so sweet. Love the Ditsy Print sent; so versatile! I LOVE your sweet card made with the Ditsy Print stamps. Thank you for the idea of coloring the back of the vellum after stamping. Absolutely love your cards! So beautiful! That Happy day banner is my fave project from everything I've seen for this release! SOOO great! Gorgeous! I love the look of the embossed vellum as the background - very elegant and I love that idea! Thanks for sharing. The embossed sentiment looks wonderful over that layer. Super beautiful card! And oh my, how cute is that banner! All are fantastic and show such a diverse variety of styles!!! Your cards are gorgeous. That top one is so beautiful. I wouldn't have thought to color the back, very clever! Oh Laurie...your card using the Ditsy Print set is so beautiful! It just made me instantly calm. Loved it! I had to check because that first card looked too busy to be one of your creations. But I LOVE it!!! Fabulous cards - I just love what you did with the Ditsy Print set. And, what a fun banner. Love the leaf canopy stamp/die set. Gorgeous simple card. The first card with the flowers was also very cute. LOVE the pink and black...it's sophisticated joy! I really like the ditsy flower card. I think it is cute and very useful. Your first card is stunning! Omg! I’m going to save this idea and see if I have a stamp set that will work!! this is an amazing set with lots of potential; thanks as always for sharing. Both cards are great. The first looks so elegant and yet it would be easy to do. The second I just love because of its simplicity. This release is joyous and your creations are wonderful -- love the banner dies! Love the banner! I can see using it a lot. beautiful creations, Laurie - the black and white is so dramatic and the soft colors are so pretty on the vellum card. All are cute ideas, but I especially love the “Hello” card with the colored on the backside vellum. That is such a great look. How gorgeous! Love the floral background! Beautiful cards and a really cute banner. Thanks for the inspiration. SO gorgeous, Laurie!! Love your colors on the first card. Beautiful. I particularly love the first card but the banner is awesome. Beautiful cards and banner! Love the vellum layer on your first card! Such pretty, soft colors on the floral design! Wow! That hello card is a knockout! And the banner is a great fun idea. Thanks! As much as I loved the soft vellum coloring of your first card, I was wow'd by the stunning sharp black stamping of your final card with the pop of pink! Love the contrast so much!!! Such gorgeous card. Love the soft feel of the first card. It looks like pretty printed muslin. And the bold, graphic look of the second is fabulous. I especially love the pink sentiment. You are such an inspiration. The cards are beautiful and I loved the banner with the use of clothes pins holding it together. Very clever. Thanks for sharing. Superfun projects, thanks for sharing! Love the look of vellum with the Ditzy stamp set. Love the hello card . Love the coloring on vellum, it give such a soft and delicate touch. I love banners too. I made one for my son on his first birthday, he is 28 and i still hang it up every year. Oh it's the banner that got me! I love those large letters! Pretty cards and colorful banner. Love the use of vellum on the first one. I love all the different ideas you showed us. The vellum makes for such a soft, gorgeous background. I love the half-stripe banners; the stripes add that little pop of interest to really make the project special. And the final card reminds me of some sort of old print style that I really like, I just don't know what it is! I wish I were better versed in art to be able to tell you, but I definitely enjoy it. Thanks for sharing all these great ideas! I love all your gorgeous creations, especially that clean & simple pink & black stunner! OMG Laurie! All your projects are amazing!!! Thanks for the inspiration! So pretty cards and lovely banner!!! So many things to love!! Love the Mega alpha's and the Ditsy, leafy, climbing clematis and so many more! really luv the vellum panel on your first design! All of your projects are so fun!! Love the boldness! Your cards and banner are fantastic ! I specially love your first card, the delicate colors are so beautiful ! Another wonderful release with some really unique stamps and dies. Love it! Thanks for all the wonderful inspiration. Beautiful cards. I especially love the first one using the Ditsy Prints stamp, one of my favorites from this release. The letter dies are huge but I love them! Thank you. All of the cards are great. Absolutely LOVE that card with the ditsy flowers! The huge HELLO is perfect over it. Like your idea of coloring vellum on the backside, too---I never would have thought of that! Thanks for the inspiration! Wow great job! Love this new release and all your great projects... The Banner Rocks!! Gorgeous cards and banner! I have to say I absolutely LOVE the first card, just ever single thing about it - gorgeous! Great projects -- love the banner and the cards. Love the flowers. 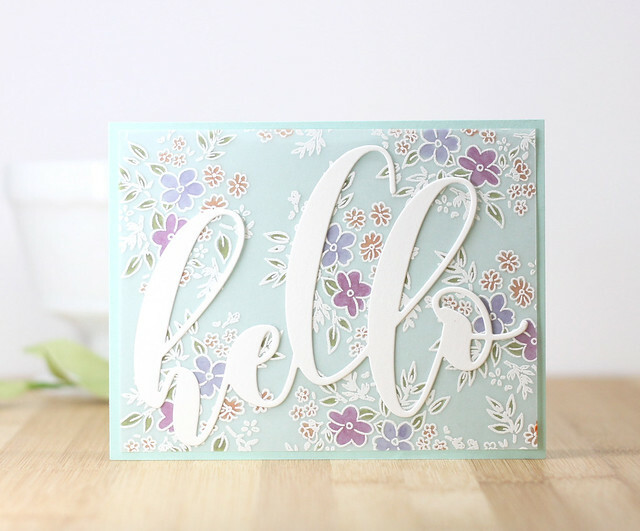 loved the way you so creatively used vellum in your project!the ditsy flowers card with hello is super beautiful! Thanks for always inspiring so many people! Banners have made a big comeback!! Beautiful projects. I love the first card. It has such a delicate, pretty effect. Thank you for sharing your creations. So pretty, I love banners too! The Leaf Canopy is my favorite! Three stunning projects! I adore the first card and will try something similar when my stash arrives. Thanks for sharing your talent. I can't decide which project I love most! The first one is just plain pretty, the second one is adorable and the third one is gorgeous. This release is off the hook! All your projects are great, but you stole my heart with that floral card. It's so sweet and pretty. The coloring on the back of the vellum is so soft, like suede. Pairing it with the giant hello was genius. Love!!!! Laurie, all your creations are wonderful! As a rule I just make cards, and I especially love the delicate flowers on vellum. Your banner was so much fun, though, that I'm thinking of ways to use that! Hi Laurie. Your cards are just beautiful and I love the designs. The banners are brilliant!!! Wouldn't kids just love that banner hanging up for their birthdays? WOW. 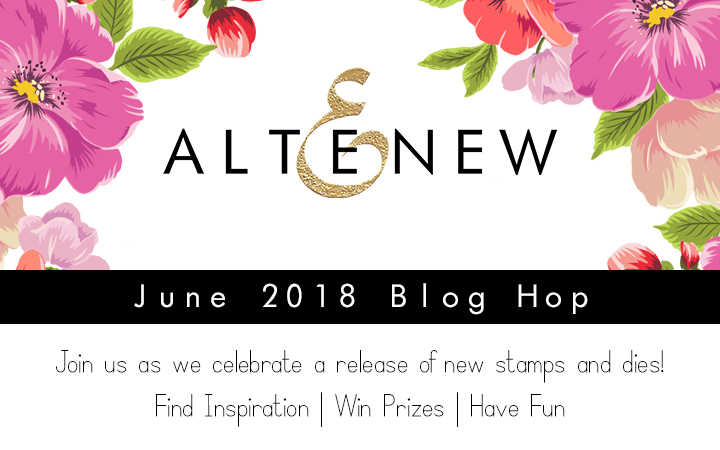 Am loving all the fabulous products in the Altenew new release. TFS. Beautiful release and cards! I especially love the white embossed vellum card and I love your CAS style!! I love your clean style - these are lovely cards. That hot pink rocks!! These are beautiful, love the variety and the simplicity ofnthese cards. Thinking to make a banner is so smart. My fave card is the pink and black one. Your card took my breath away! It is so gorgeous. I like all of these, especially like the idea of coloring on the back of the vellum. Wow I love your cards and the banner is so cool! What a great release! Currently bed bound with severe ME/CFS so can not do card making at the moment but gathering a list of supplies and techniques I want to try the moment I can. My motto is to "learn until I can do again" Your cards and banners are inspiring! Can't wait till well enough to try again! Thank you for sharing your talent! So much goodness and inspiration in this release and your post!! I really love the look of the Pinstripe stamp! It makes it look like you have 2 tones of paper! What a great idea! I love your soft floral background! There are so many wonderful products in this release to love and your projects showcase them beautifully. Wow that first card is super nice! That large sentiment looks great over the fun and pretty background! I am in love with your first item. It is so soft looking and the flowers are great embossed in white on the vellum. All of your projects are wonderful, but the Ditsy Print card has my heart. It is lovely, a little piece of perfection. Thank you for sharing the details.